Whenever the skin sustains damage, there is a possibility of scarring. Commonly scar result from trauma, surgery, acne, burns, chemical injury and some skin diseases leave a scar after healing. Broadly speaking scars are either atrophic or hypertrophic. 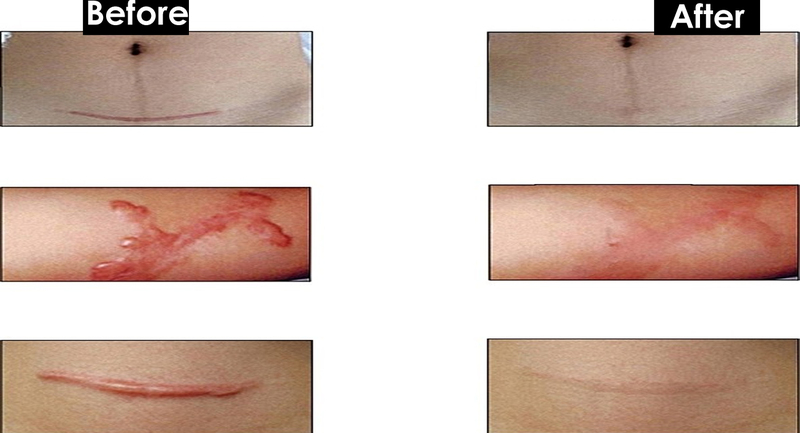 The treatment approach is different for these two broad groups of scars. Treatment options for scar include drugs (topical and injectable), surgery, Microneedling, Lasers, chemical peels, fillers, fat transfer, compression garments. 1. Drugs:- many creams and gel are now available which improve the scar in terms of its texture, softness, and appearance. They have an additive effect when combined with other treatments. They contain different agents like allantoin, silicon, steroids. Steroid injections are required for treating keloids and hypertrophic scar. 2. Surgery:- Scar revision surgeries help in restoring the scars appearance by reducing its size or changing its orientation. Surgery is generally followed by other resurfacing procedures. 3. Microneedling:- it leads to deposition of new collagen and thereby smoothening of the atrophic scars. 4. Lasers:- they cause controlled damage to the dermal tissue and subsequently when healing occurs the new scar is better in terms of cosmesis. 5. Chemical peels:- they improve the pigmented scars. 6. Fillers and fat transfer are done to give quick results to the patient with atrophic scars. 7. Compression garments:- required primarily for management of post-burn scars. Which treatment option will be good for you can be decided your dermatologist after examining the scar. Consult at Skin Care World for the treatment of any kind of scars. Please fill your preferred date and timings, you will get a call soon.